U.S. Home Infusion Therapy Market size was valued around USD 7 billion in 2017 and is expected to witness more than 10% CAGR from 2018 to 2024. Technological advancements such as automations in the medical devices have fuelled growth of U.S. home infusion therapy market. These technological advancements enable improvisations in the existing medical products thereby enhancing user experience. For instance, the infusion pumps used in the home infusion therapy have been modified into smart infusion pumps to reduce dosage errors that may otherwise occur while using conventional infusion pumps. Government initiatives such as increase R&D funding to facilitate modifications in infusion therapy products will propel business growth. Growing geriatric population is one of the major industry growth drivers. Statistics presented by World Atlas supports the fact that by 2060 elderly population in the U.S. will be more than 98 million. Geriatric population is more prone to infections due to poor immunity that increases the rate of infections supporting the U.S. home infusion therapy market growth. More preference is given to the home infusion therapy by the elderly based population due to ease and convenience. Rising prevalence of chronic diseases such as cancer, diabetes and COPD have increased the demand for home infusion therapies market. Continuous monitoring and treatment of chronic diseases will boost market growth. However, unfavourable reimbursement scenario will restrict the market growth over the forecast period. Infusion pump segment held around 51% in market share in 2017 and is estimated to grow at a CAGR of 9.8% over the forecast timeline. Growth is attributed to modifications incorporated in infusion pumps that have reduced errors while administering the fluids in patient’s body. Rising prevalence of diseases and surgical procedures have escalated demand for infusion pumps. Needleless connectors segment will grow at a CAGR of 10.5% over the forecast period due to growing demand for hydration therapies and rising prevalence of diseases such as malaria, dengue and others that requires continuous supply of fluids. Patients suffering from chronic conditions require continuous supply of medical accessories such as needleless connectors thereby will accelerate business growth over the forecast timeframe. Anti-infectives accounted for over 27.5% market share in 2017 and is anticipated to continue dominating the industry over the upcoming years. Growing rates of bacterial, viral and other infections coupled with rising rates of hospital acquired infections escalate the demand for anti-infectives therapy enhancing overall industry growth. Parenteral nutrition segment will witness lucrative growth over the coming years owing to increasing demand for home infusion therapies. Around 40,000 people in U.S. receive home parenteral nutrition safely through variety of catheters. The therapeutic benefits as well as treatment against poor functioning of gastro-intestinal tract disorders through parenteral nutrition should propel its demand over the forecast timeframe. 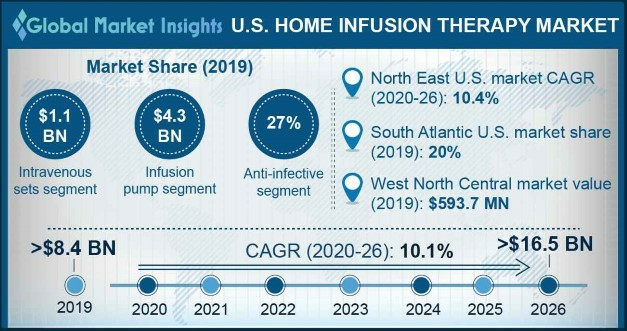 South Atlantic home infusion therapy market will grow owing to rising number of home infusion therapy pharmacies in the region. These pharmacies treat the patients that are suffer from chronic as well as acute diseases. Moreover, increasing average household income of population enhancing the investment capacity of population in healthcare services will positively impact adoption of home infusion therapy. Pacific Central home infusion therapy market is anticipated to grow at 11.7% CAGR over forecast period due increasing number of government initiatives that have resolved the affordability issues of geriatric population. Such initiative has proven beneficial for geriatric population for availing the home infusion therapies thereby fuelling overall industry growth. Major industry players operating in U.S. home infusion therapy market are Amsino International, Baxter International, B.Braun, Becton Dickinson, Caesarea Medical Electronics, Fresenius Kabi, Halyard health, ICU Medical, Moog, Smiths Medical, and Terumo Corporation. Strategic initiatives undertaken by key industry players include merger, acquisitions and new product launch to assist in gaining competitive advantage as well as achieve sustainable profits. For instance, in February 2017, ICU medical Inc. completed the acquisition of Pfizer’s Hospira infusion systems business. The inclusion of Hospira’s IV pumps, devices and solutions to ICU Medical’s current portfolio will aid in revenue generation of the company as well as diversification of product portfolio. 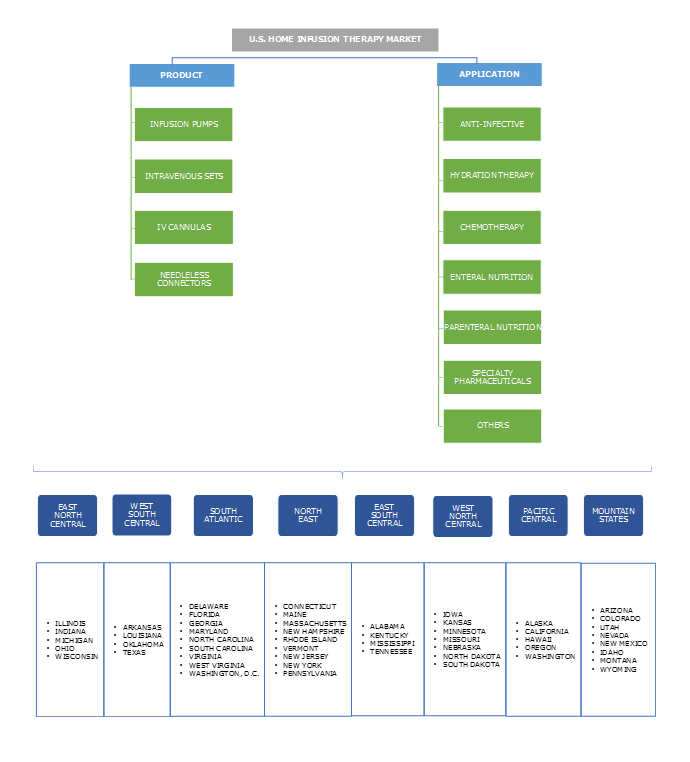 The key industry players have been undertaking numerous strategic initiatives to improvise their product offerings to increase market share as well as strengthen product portfolio. Modifications are being made by integrating advanced technology into the medical devices that are being used in the home infusion therapy to reduce errors, thereby increasing adoption rate of the device. Medical insurance companies such as Medicare and Medicaid are focusing on improving the reimbursement structure for home infusion therapy will positively impact industry growth. Furthermore, improving economic conditions in emerging regions of the U.S. have escalated the overall adoption of home infusion therapy in the country.